Mark Solomon decided to design a unique dock for an iPhone, iPad or iPod, and then subsequently started a Kickstarter project to get it funded, into production, and into your hands. The dock, named Moboto, has a personality and character that go along with it. 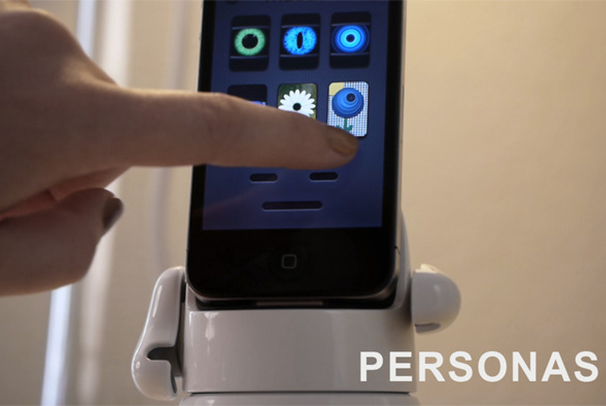 When you drop your iPhone into Moboto, it comes to life with a persona that lives on your phone and interacts with you and its surroundings through a variety of sensors to make it a fun yet informational experience. You can swap around the various skins, as well as the actual dock itself, which comes apart into two pieces. The entire product is designed so that it’s easy to swap parts to customize Moboto to your liking. These interchangeable parts--the base of the dock and the top portion that connects to you iPhone--use a simple twist-to-lock design. Mark plans to release the CAD files necessary to recreate the twist-to-lock mechanism to the community, so if you have a 3D printer, you'll be able to print you own bases for the Moboto. 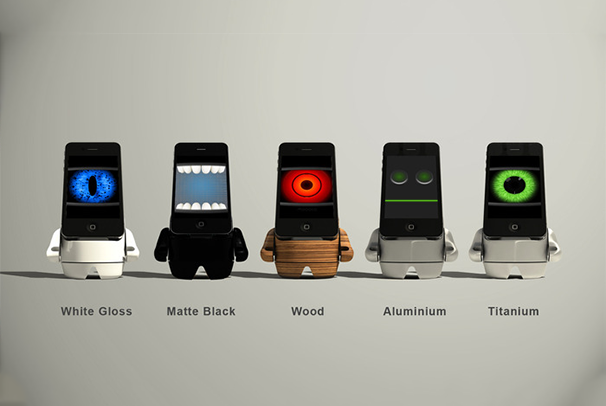 Moboto should be able to do more than just look cool while it charges your i-product. Mark designed the different elements of the display to subtly show information such as the time, the battery percentage, or the weather. Moboto also can talk to you or lip-sync to a song if you want. Mark and his team want to bring this technology to iPhones right now, and also to Android and Windows phones after the initial launch--a solid strategy, since the wide range of android devices makes it difficult to create a universal product for them all. For now, you can secure one of these cool little docks for a $35 pledge, but there are a huge range of rewards for different pledge levels over at Kickstarter you should check out. Mark's got an ambitious goal, and a ways to go, so if you really want it you better get over there and pledge.